Thai police have begun searching a Buddhist temple complex in a bid to arrest an influential monk wanted over alleged money laundering. Officers entered the site after previous attempts were thwarted when thousands of the monk's devotees turned up in his defence. The spiritual leader is believed to be inside the large compound. Police said they did not find him on Thursday but would return on Friday to continue looking. A Thai police spokesman said officers covered 15-20% of the complex. The search warrant was valid for 10 days, he said. The Dhammakaya temple is a sprawling compound on the outskirts of Bangkok. Its founder, Phra Dhammajayo, is accused of embezzling funds from the temple, but when officers attempted to search the site last June they were blocked by his supporters. The 72-year-old abbot has remained inside the temple for months, saying he is too ill to face officials. He denies the allegations and says they are politically motivated. 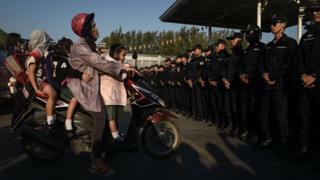 Thousands of police and soldiers surrounded the site before dawn on Thursday, blocking the roads leading to and from the temple and putting the area under military control. "We are sealing off the temple and after that we will search all the buildings," said Col Paisit Wongmaung, head of the Department of Special Investigations (DSI). "If [the abbot] thinks he is innocent he should surrender and enter [a] judicial process," he said. A spokesman for the temple said he did not know if Phra Dhammajayo was inside. "I don't know his whereabouts - I haven't seen him in about nine months," AFP quoted spokesman Phra Sanitwong Wutthiwangso as saying. There have been several failed attempts to persuade the former abbot to leave the temple, which is home to a charismatic Buddhist sect. It has more than a million followers but has been criticised for commercialising Buddhism. There is also speculation that the temple has links to former Prime Minister Thaksin Shinawatra. Both his government and one led by his sister were ousted by military coups in 2006 and 2014. The temple, however, says it has no political affiliation and says it attracts Thais from all walks of life and political persuasions. The military has been running Thailand since the coup in 2014.